LATELY I have been wresting with a particular problem in the lab. I have been trying to put a rather complex DNA molecule down on a gold surface with the aim of having it perform the same chemistry on a surface as it does in solution. Generally, when putting DNA down on a gold surface, we synthesise our DNA with a particular chemical modification, a thiol, on one end of the DNA strand. A thiol is essentially a sulphur atom, usually together with a hydrogen (-SH), and sulphur forms a strong bond with gold, so this is we want. Unfortunately, we live in a very oxidizing world (basically, everything rusts), so my thiol gets oxidized to a rather less useful S=O. There are numerous other atoms that can reduce my thiol too, such as other thiols, or metals such as magnesium, zinc, copper etc. This isn’t generally a problem as an oxidized thiol can be reduced back to -SH, making it ready to react with my gold surface. Only, it turns out that my DNA adheres to the gold at too great a density. Like a mosh pit at a concert, the poor blighters are unable to move, and this results in them being unable to perform the particular reaction that they normally manage when not constrained. So I modify my approach and use another layer between the gold and the DNA. This layer can be used to dictate how much of the gold surface is actually available to be bound. The chemistry is quite complicated, with several steps, all of which degrade quite rapidly, so it has me running around to make sure I get all the steps completed in time. First a layer of long floppy carbon chains go down on the gold, and the ends of these molecules are reacted with another chemical that makes them able to react with yet another chemical, this latter chemical being capable of reacting with a thiol. Phew. I have spent more time than I care to mention trying to get this approach up and running, all the while having to deal with the fiddly, slow and rather cumbersome thiol-based chemistry, which has a propensity to rust. Then it occurs to me. The only reason I was using a thiol on my DNA in the first place was to stick my DNA directly to a gold surface. As I’ve already determined that we can’t do this (too dense), I really don’t know why I’ve spent time running around testing numerous crosslinking agents that can link the surface to my thiol-DNA. Time to ditch the thiol and use something that connects DIRECTLY to the first layer of floppy carbon chains. EARLIER this year, Sense About Science, a charity that seeks to promote good science and evidence in public debate, submitted a letter to the World Health Organisation (WHO) asking them to clarify WHO’s position on the inappropriate use of homoeopathy for five serious diseases: HIV, TB, malaria, influenza and infant diarrhoea. The use of homoeopathy as a treatment for such conditions is inappropriate because, basically, it doesn’t work, and the promotion of homoeopathy as a preventative medicine in the developing world is immoral and unethical. In Kenya, the largest homeopathic supplier, the Abha Light Foundation sells homeopathic medicines for malaria, diarrhoea and influenza. It now runs 20 health centres, 25 mobile clinics and five HIV/AIDS clinics. In Tanzania, Jeremy Sherr and Sigsbert Rwegasira run three homeopathic clinics and claim to have government support to establish a school of homeopathy. Rwegasira claims to treat “no less than 100 malaria patients per day.” According to Sherr’s promotional material, “conventional medicine only supplies temporary relief, often at a great cost financially, and with many severe side effects”. In Ethiopia, the Amma Resonance Healing Foundation, run by Peter Chappell, offers to treat AIDS patients with “resonance healing in the form of homeopathy”, as “an ideal alternative and complement for the treatment of HIV/AIDS in developing countries” because of “the very low costs of producing the remedy” and because it has “no side effects”. In Ghana, the Senya/Tamale Homeopathy Project treats malaria patients with homeopathy. In Botswana, the Maun Homeopathy Project offers homeopathic treatment in several locations and mobile clinics for HIV related complaints such as herpes and diarrhoea “for those people who are HIV+ but who are not taking anti-retroviral drugs”. Today the WHO issued a response stating that it DOES NOT recommend the use of homoeopathy for treating HIV, TB, malaria, influenza and infant diarrhoea, with each of the departments tasked with tackling each of these five serious diseases clearly expressing WHO’s position. Visit Sense About Science to read a briefing document about homoeopathy, so that you can better understand why it is that scientists and medics do not support its use in serious diseases. The blogdom of skeptics has been in uproar over the ruling of Mr Justice Eady in the libel case Simon Singh vs British Chiropractic Association (BCA). The case has already been covered extensively, by The Lay Scientist (background | verdict) and Jack-of-Kent (background | verdict). The ruling hinged on Simon Singh’s use of the word ‘bogus’, which means counterfeit or fake, spurious, or bad. Unfortunately, when you start thinking about it meaning ‘counterfeit’ then this infers some degree of fraudulent use, or deliberate misuse, which is how the judge chose to rule in this case. Mr Justice Eady decided (evidently prior to the hearing had commenced) that the definition would be taken as consciously and deliberately dishonest. In this case it rules in the favour of the BCA where, by the judge’s own reasoning, Simon Singh has libelled them by labelling them deliberately dishonest. It seems strange that a judge can make any objective ruling on the definition of such a word in this case; Mr Justice Eady has effectively ‘cherry-picked’ the evidence by looking at the word ‘bogus’ within a paragraph, without including the evidential support of context from the chapter as a whole. As I have discovered through word battles myself, different people lean towards different definitions of words when multiple definitions are available. An example might be ‘tautology’, which in one vein can be a rhetorical definition of ‘using different words to say the same thing twice’, yet can also have a meaning in logic of ‘a statement that is necessarily true’. What distinguishes the uses is the context in which they are used, and this seemed to be apparent in this case. AMALGAM, a compound of mercury with another metal, has been used for fillings for 200 years. A ScienceDaily news article says, ‘Amalgam fillings are safe, but sceptics still claim controversy’. Speaking at the 87th General Session of the International Association for Dental Research in Miami, Dr Rod Mackert, of the Medical College of Georgia, points out that someone would need 265 – 310 amalgam fillings before even slight symptoms of mercury toxicity could be felt. The reason being that when mercury is mixed with the other metals used in fillings (silver, tin and copper), the compound produced contains no free mercury. A poison is only a poison when it is at the right dose; a fact that has been appreciated for hundreds of years. You may absorb only 1 micrograms (1/1millionth of a gram) of mercury a day from a mouthful of fillings, yet consume around 6 micrograms from food, water and air, according to the US Environmental Protection Agency. 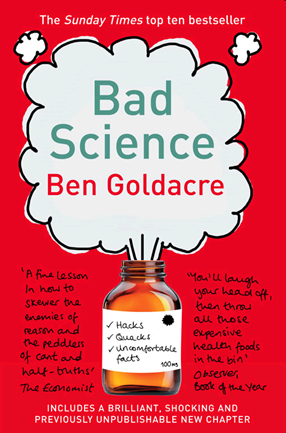 I have reposted the article in full, but you can just as well read it on Ben’s blog, or hell, you could even go spend a few quid and buy his book! Published by Harper Perennial 2009. This chapter did not appear in the original edition of this book, because for fifteen months leading up to September 2008 the vitamin-pill entrepreneur Matthias Rath was suing me personally, and the Guardian, for libel. This strategy brought only mixed success. For all that nutritionists may fantasise in public that any critic is somehow a pawn of big pharma, in private they would do well to remember that, like many my age who work in the public sector, I don’t own a flat. The Guardian generously paid for the lawyers, and in September 2008 Rath dropped his case, which had cost in excess of £500,000 to defend. Rath has paid £220,000 already, and the rest will hopefully follow. A little long, didn’t fly, but better luck next time. [Guardian, Tuesday 31st April] Cherill Hicks article, ‘Not to be sneezed at’, gave a timely and largely useful revision of therapies available to hay fever sufferers, but tripped up by suggesting that research on homeopathic treatments was ‘encouraging’. It is still the consensus in the scientific literature that homeopathy does not perform any better than placebo, an issue which has been addressed by a comprehensive study by Aijing Shang MD and colleagues at the University of Berne, Switzerland. The study, published in The Lancet (2005), compared 110 homeopathy trials with 110 conventional medicine trials, and found that conventional medicines work, with little evidence to say the same of homeopathic medicines. The positive findings of a few placebo-controlled trials of homeopathic medicines are cherry picked from a mountain of contradictory results, and are generally found to result from combinations of methodological deficiencies and biased reporting. The ‘encouraging’ results for treatment of hay fever with Galphimia glauca arise from a series of studies by a single homeopathy research group, and have been given unwarranted kudos in homeopathy circles due to the publication of a meta-analysis, which is an analytical over-view of combined results from numerous methodologically similar studies. However, the meta-analysis only consists of seven trials (included in the Lancet study by Dr Shang and colleagues), and all come from the same research group; indeed, the group leader was a co-author on the meta-analysis itself. There are insufficient data from independently reproduced studies to corroborate the positive findings for Galphimia glauca as a treatment for hay fever, thus its status as a recommendable therapy is dubious.